As you&apos;ve probably noticed, from his interviews on NBC, ABC, TMZ, The Alex Jones Show, and elsewhere, "wedge" master Charlie Sheen is a walking soundbite of winning. (Winning.) The man has come a long way from less flattering soundbites such as calling his ex wife, Denise Richards, the n-word in a leaked voice message. If his endless media blitz, which has seen him #based and setting records with his new new Twitter feed, has left you cowering in the corner, longing for the days when Sheen was totally ignored on Two and a Half Men, there is an upside: All his nonsense makes for quite an outstanding soundboard, one which you can use to prank friends, enemies, and radio show hosts. 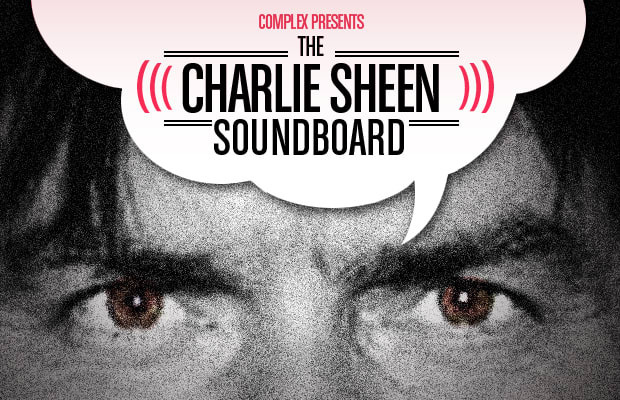 Hence, Complex presents The Charlie Sheen Soundboard. Bring it. Winning. Etc.